There were 695 press releases posted in the last 24 hours and 153,744 in the last 365 days. Have you tried to create a company culture that eliminates bullying? Read more to learn how you can teach employers to spread a healthy workplace environment! AUSTIN, TX, UNITED STATES, July 10, 2018 /EINPresswire.com/ -- In a world that seems increasingly polarized, business owners and managers need to be alert to the threat of employee harassment in the forms of bullying and mobbing in the workplace. What are bullying and mobbing? Is it the same thing as harassment? Social interactions and the language we use to describe them keep changing over time. If you were to take a poll 30 or 40 years ago asking people to provide a definition of the term bullying, most would describe something along the lines of an altercation on the playground at school – often leading to an uncomfortable visit to the principal’s office for a warning or threat of detention, followed by a strongly worded parent-teacher conference. Bullying at Work: How to Confront and Overcome ItIn the 1980s, the late BBC journalist, Andrea Adams, host of the radio program An Abuse of Power, began an extensive campaign against the phenomenon of what she termed “workplace bullying” – a topic she wrote about extensively in her 1992 book Bullying at Work: How to Confront and Overcome It. This expression, workplace bullying, encompasses a whole range of negative behaviors, instigated by either an individual or a group of employees against another employee. Bullying in the workplace can lead to various forms of victimization, ranging from physical assault, verbal badgering (such as insulting remarks), emotional abuse, intimidation, aggression, psychological or sexual harassment, to negative social interactions, such as isolation, shunning or spreading false rumors to discredit an individual. What about this term mobbing? While workplace bullying or harassment is the predominant terms used in the U.S. and the U.K. to describe this type of malevolent behavior at work, another term for workplace bullying has emerged in other parts of the world — mobbing. It’s derived from the concept of mob rule, e.g. a crowd that engages in lawless, violent behavior directed against individual victims. 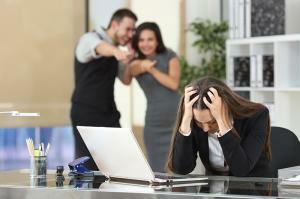 What are the ways bullying/mobbing negatively impact employee development? Companies invest a lot of time and resources recruiting, hiring, and training their employees, so from a purely economic cost basis, any instance of workplace bullying can be costly — from losing a valued employee to defending a labor law legal challenge brought by a victim (more on these business impacts later). But for the employees that get singled out for harassment, workplace bullying can be devastating — with consequences ranging from a serious disruption to their path up the career ladder to more serious psychological complications that can even affect their mental and physical health. Signs of workplace bullying can range from absenteeism, lack of organizational commitment, anxiety, depression, job burnout, to varying degrees of psychological distress. In fact, some researchers contend that in extreme cases, victims of workplace bullying can be as psychologically and physically debilitated as those who have been diagnosed with PTSD (post-traumatic stress disorder) — such as military veterans, or those who have survived acts of terrorism or severe natural disasters. What are the risks to business that arise from bullying/mobbing in the workplace? 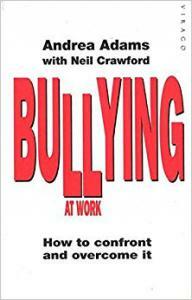 How does workplace bullying come about and what can you do if you feel you are a victim of bullying? 1. Learn to recognize bullying behavior patterns and their underlying causes. Are you being singled out by your peers and subjected to aggressive behavior by a colleague or manager? Shouting, name-calling and derogatory comments are common signs of workplace bullying, particularly at a lower level or entry-level positions. As one advances up the career ladder, workplace bullying often takes the form of actions designed to block career advancement; examples of these range from exclusion from project assignments that would lead to higher-level responsibilities to cases of constructive dismissal (where levels of harassment at work become so unbearable that the employee is compelled to quit). What are the reasons for this behavior? Psychologists believe that in many cases, the underlying cause for the bullying behavior is actually insecurity and jealousy on the part of the instigator, which in turn, causes them to try to achieve perverse satisfaction by tormenting, controlling, or blocking the success and career advancement of their targeted victims. 2. Decide if this is just an unpleasant work situation or a true case of workplace bullying. How can you be sure you are a target of bullying?